What does Mrs. Jacqueline Kennedy have in her left hand underneath the red roses? 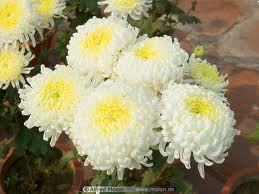 or whether it is merely a small bouquet of white chrysanthemums. In reality it really doesn’t matter to me becasue whatever it is it should not have been used to ridicule Jean Hill. The history of the issue needs to be understood. So, I will try to put it in context. Jean Hill, the lady in red, should be known to all JFK assassination researchers. 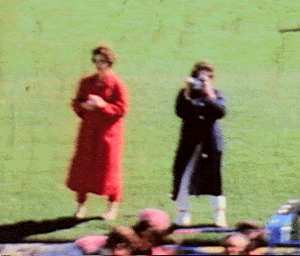 She is seen in many photographs and films during the assassination, none more so than the Zapruder film. Jean Hill in her red raincoat. She wore a lite red raincoat and stood next to her friend Mary Moorman who took a famous black and white Polaroid photograph during the assassination. Hill gave a statement about what she saw during the shooting. She described seeing JFK and Jackie leaning in towards one another and something that looked like a little white dog sitting between them. She mentioned this dog in a TV and radio interview given very shortly after the assassination. Jean's initial interview was broadcast by WBAP-TV, a Ft. Worth/Dallas NBC affiliate at 1:11 C.S.T. The dog story appeared in the local press the next day in THE DALLAS TIMES HERALD, Nov. 22, 1963, p. 17. 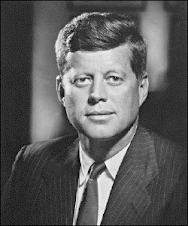 And its brought up during her testimony to the Warren Commission in Volume 19, p. 479 and 487. 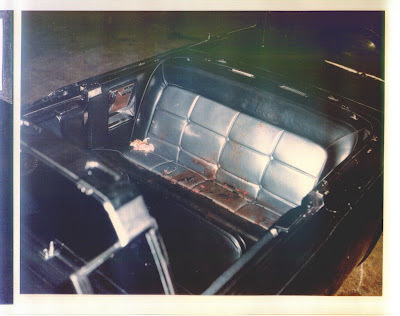 Since it is easy to see that there wasn’t a real live dog in the car some people, most notably Warren Commission counselor Burt Griffin, sought to use this “white dog,” to attack Hill’s credibility and denounce everything she said and heard. Since she said and claimed things that are at variance with the official story of one lone gunman and only three shots attacking her credibility was and remains paramount to Warren Commission apologists and defenders. She was ridiculed for years as being this crackpot woman who saw a white dog that did not exist, therefore everything she said she saw is a figment of her imagination too. Until 1993 when Wallace Milam found something. 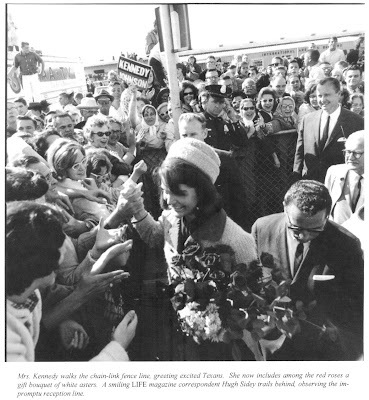 What he found was a piece of black and white film of JFK and Jackie working a fence line and shaking hands with a tiny portion of the people who had come out to see them at Love Field airport. The President and the First Lady flew in from Ft. Worth. As Jackie descended from the plane there was a small line of dignitaries to greet her and President Kennedy. One of these dignitaries gave Jackie a bouquet of red roses. This was Mrs. Elizabeth "Dearie" Cabell, the wife of the Mayor of Dallas, Earle Cabell. Jackie still had these in her arms as she moved over to the fence line where JFK unexpectantly went to meet and greet some of the local citizens. 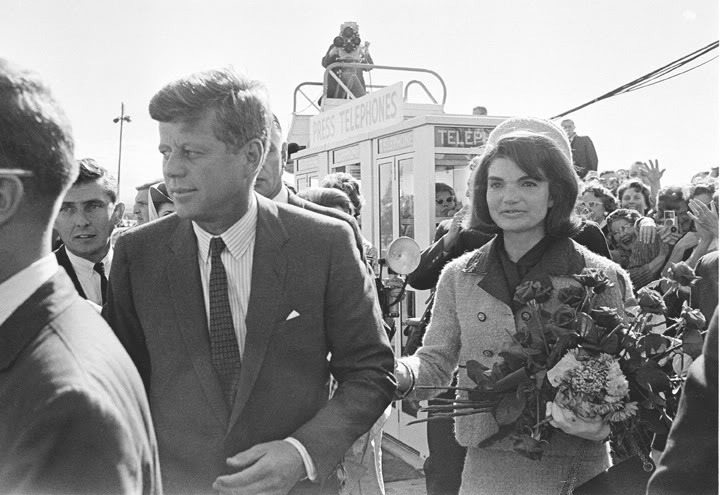 It is during this time that someone gave Jackie either the small Lambchop like puppet or a quite small bouquet, by comparison to the red roses, of white flowers. Or, perhaps Jackie was given a small bouquet of white flowers AND a white toy dog. I rewatched the videotape of Walalce Milam’s 1993 presentation. He stated that a little girl gave Jackie the white dog toy. However, I could not ascertain this in the film he showed. He showed a still frame from a black and white film showing Jackie entering the presidential limousine. And, yes, it does look like she has a dog like toy in her hand. The snout looks darker than the top of its head and sides. Those appear white. Keep this two tone color difference in mind. Robin Unger has discovered and posted on the Lancer forum a large photo of Jackie at the fence line. (Unfortunately, he has not cited the source.) This large photo looks like it came from LIFE magazine, certainly a large magazine. Jackie has already has been given the white flowers. And Clint Hill clings to Jackie’s side like white on rice. 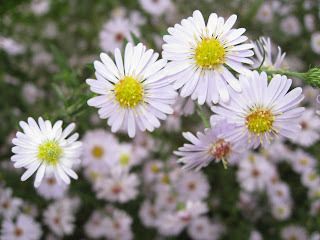 The caption to the photo identifies the small white flowers as white asters. So, I looked online for information about white asters. There are apparently several varieties. The bouquet Jackie holds does not appear to be the white heath aster. But, I could be wrong. 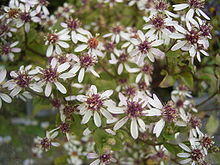 It seems to resemble the white wood aster. There is one variety of white wood asters that don't look white. And ironically enough I got this pic from Wikipedia. You will note the white leaves have a darker, almost, again ironically, pinkish-grey color. I never believed the dismissive claim that the white dog was nothing more than white chrysanthemums. White chrysanthemums are round, like a ball, and BIG. Each flower is a large round ball. The floral leaves, or pedals, are curled up and inward. Wikipedia describes the pedals as "deeply lobed." Regardless of what it really is it had to have been given to her when they greet people and shake hands at this fence. 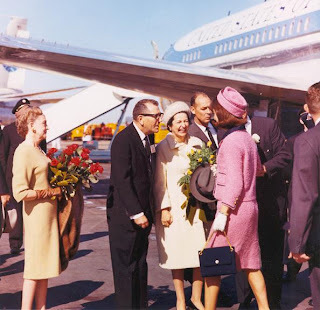 I know of no film or photograph that shows Jackie getting an additional bouquet of white Chrysanthemums flowers from the small group of dignitaries, one of whom definitely gave her the red roses. 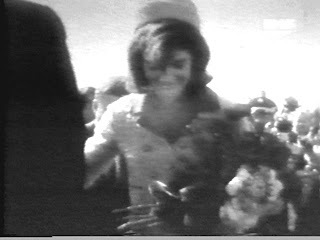 When Jackie gets the roses is well documented in films and photos. This is not true of what exactly is going on when JFK unexpectantly goes to shake a few hands along the fence. Press and common people had to hurry to get a good view and take a good film or photo of this spontaneous act. Wallace Milam found a black and white film, I believe it is an NBC film, and Wallace found a moment when Jackie is given something. This film had Jackie in front of JFK. The fence is filmed at an angle so if you drew a line on a clock from 5 o'clock to 11 o'clock the angle of the fence looks like that. Jackie is down range and JFK is closer to the cameraman filming this. Examination of this issue as with almost all issues of a photographic nature in the JFK assassination case is hindered by a lack of availability of the photos and films one desires to study. Now in the 21st century the internet makes such studies much easier with websites that have collected photos and films. But no one site had all the films and photos one would like to study. I wish I could get these next two photos to appear side by side. Maybe this will work. 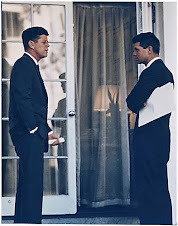 Okay, Randy Owen found this photo of JFK and Jackie with a phone booth behind them. This photo, and this photo alone did not prove to me that there was no lambchop, that it was only a bouquet of flowers. 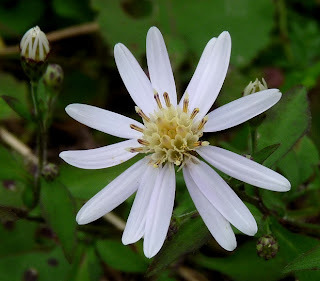 Randy's photo, plus Robin Ungers, plus a brief study of the flower White Asters leads me to the conclusion that, yes, it is probably a bouquet of two types of White Asters. 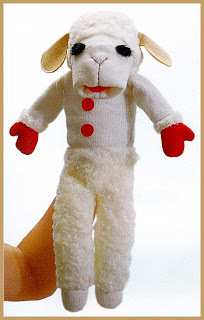 So, as I see it the current state of the issue is this, it remains a possibility that Jaqueline Kennedy was given a white toy dog and a small bouquet of white asters. But, it is probably only a bouquet of two differing varieties of white asters. I think Jean Hill had some sharp eyes to see the white flowers and or dog, something no other witness commented upon, during the shooting. Robin Unger’s contribution, in my opinion, negates identification of the white flowers as being Chrysanthemums. White asters is probably correct. The film Wallace Milam showed at A.S.K. ‘93 needs to be further studied. The key point here, and the only reason I can concieve of why people get into this issue at all is to attack or defend Jean Hill. It really doesn’t matter if it was white flowers and no white dog toy; a white dog toy and no flowers; or a white dog toy and white flowers. 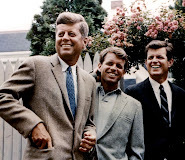 There was at least one white something there lying between JFK and Jackie. Jean Hill should never have had her credibility attacked over this. The Secret Service photographed the presidential limousine in the garage of the White House on November 23, 1963. 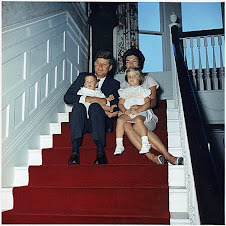 And there is clearly a white something in the right seat corner, right where JFK was sitting. So, what did I learn from looking at this? Perhaps to do my own research, perhaps it is to put your beliefs to the test. But I think if we’re honest with each other and share information more often than we share our conclusions we can get some good research done. And if we did that we’d be a better community.